I did the International Baccalaureate in Dar es Salaam, Tanzania. I took Language & Literature, Economics, Visual Arts, Math Studies, French Language, and Design Technology. City has one of the top law schools, and it was also very important for me to find a university in central London, as I love the city. Furthermore, it is a university that is constantly investing in itself and its students. It’s a university that’s going places! Quite easily the people and the opportunity. I’ve made some lifelong friends here, not to mention I’ve had the chance to work with amazing student leaders and staff. I’ve always received support and encouragement from City, be it through the Union, Careers Service or friends that I have made - I am confident to try new things, and build on my experience. I am currently the Raising and Giving Officer with the Students’ Union. This is a part-time officer position that gives me the chance to oversee and put together charity fundraising activities and campaigns at university. I also work as a Student Ambassador. This role gives me the opportunity to support students in making choices about university, and showing them that they have options. 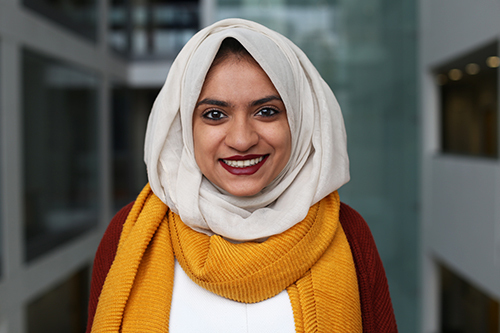 Other things involve playing for the women’s football team, communication’s officer for the law society, and am an Academic Societies' Representative on the Societies' Board with the student union. Right now, it’s between doing a qualifying year (LPC, BPTC or the Bar abroad), a Master’s in Crisis Management, or possibly even working for the Students’ Union. You never know! Make sure you do your research and figure out what kind of university is best for you. It’s very important that you feel comfortable and engaged wherever you go. Identify what things you think are essential in a university and start looking there.